February 11, 2019 — Award-winning global entertainment and event distributor Trafalgar Releasing brought the filmed version of the star-studded tribute concert, The Music Center Presents Joni 75: A Birthday Celebration, to more than 410 movie theaters across the US and Canada on Thursday, February 7, for a one-night cinema event. This successful theatrical release, which has already amassed more than half a million dollars at the box office and achieved the highest per screen average of all titles showing in more than 100 locations on Thursday, comes on the heels of Trafalgar Releasing’s record-breaking release of Burn the Stage: the Movie featuring K-Pop sensation BTS, and the critically acclaimed Coldplay: A Head Full of Dreams, which both released in November 2018. By popular demand, The Music Center Presents Joni 75: A Birthday Celebration has added 115 showings lasting through March 3 in select markets. Cities which saw the highest turnout from fans included Los Angeles, New York, Sacramento, Providence, RI and Portland, OR. Captured live at the Dorothy Chandler Pavilion, this special event features Brandi Carlile; Glen Hansard; Emmylou Harris; Norah Jones; Chaka Khan; Diana Krall; Kris Kristofferson; Los Lobos with La Marisoul, Cesar Castro & Xochi Flores; Graham Nash; James Taylor; Seal; and Rufus Wainwright, who performed many of Mitchell’s songs including A Case of You; Both Sides, Now; Down To You; For The Roses; The Boho Dance; and Two Grey Rooms; among others. Co-musical directors, providing the musical arrangements for the show, are percussionist Brian Blade, who recorded three studio albums and toured extensively with Mitchell, and, pianist, composer, arranger producer Jon Cowherd. In addition to the live concert and cinema release from Trafalgar Releasing and The Music Center, an album featuring the participating artists, entitled “The Music Center Presents Joni 75: A Birthday Celebration” will also be available March 8. Following the successful US screenings, The Music Center presents Joni 75: A Birthday Celebration will be coming to cinemas worldwide on March 21. More information about future screenings can be found at www.Joni75.com. Music fans will also get the chance to experience the “beautiful, pitch-perfect” (NY Times) voice of the multi-platinum award-winning singer, songwriter and global superstar Josh Groban, when Trafalgar Releasing brings Josh Groban Bridges From Madison Square Garden to more than 350 theaters nationwide, across the US and Canada on Tuesday, February 12. Recorded before a live audience at the iconic Madison Square Garden venue, the show includes a mixture of new songs and classic hits as well as duets withTony-Award winning, multi-platinum recording artist and actress Menzel and Sugarland-star and Grammy-Award Jennifer Nettles. 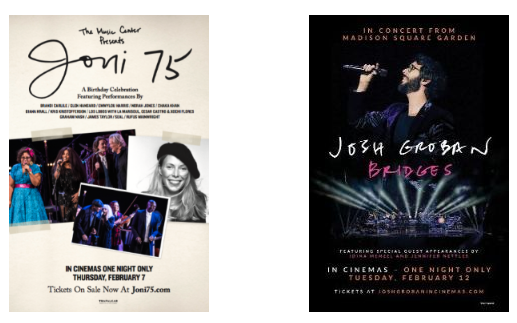 Tickets and information can be found at www.joshgrobanincinemas.com. Trafalgar Releasing also just announced 311: ETSD3, a documentary film about alternative rockers 311, which will screen in hundreds of movie theaters nationwide for one night only on 311 Day, 3-11-19. The film focuses on the relationship the band has shared with its fans over its nearly 30 years together. Tickets and more information can be found at www.311incinemas.com. In addition to music projects and live concerts, Trafalgar Releasing also brings a selection of ballet, opera, arts and theatre productions to the big screen. Trafalgar Releasing is an award-winning, market leader in global event distribution, working in partnership to unite audiences with entertainment and the arts. Trafalgar Releasing is an integral part of Trafalgar Entertainment Group. Since its launch in 2006, Trafalgar Releasing (formerly operating as Picturehouse Entertainment) brings special events to the big screen around the world. Our theatre slate includes the Tony award-winning The King & I: From The London Palladium, Michael Grandage’s acclaimed production Red starring Alfred Molina, Funny Girl The Musical starring Sheridan Smith, the Olivier and Tony award winning An American in Paris: The Musical, The Rocky Horror Show Live, Kenneth Branagh Theatre Company’s live season and Monty Python Live (mostly). Trafalgar Releasing works with some of the world’s most renowned houses & companies, distributing high-profile arts content to cinemas worldwide from the Royal Shakespeare Company and the Royal Opera House. Additionally distributing in the UK, content from the Bolshoi Ballet, Glyndebourne and The Metropolitan Opera. Our music slate includes Coldplay: A Head Full of Dreams (directed by Mat Whitecross), Burn the Stage: the Movie (the first feature length film from K-Pop band BTS), Muse: Drones World Tour, Sophie Fiennes’ Grace Jones: Bloodlight and Bami, David Gilmour Live at Pompeii, Roger Waters The Wall, Rammstein: Paris and Black Sabbath: The End of The End, alongside our collaboration with Nick Cave and the Bad Seeds, Distant Sky – Live in Copenhagen, One More Time with Feeling (directed by Andrew Dominik) & 20,000 Days on Earth. In addition, Trafalgar Releasing has distributed award winning feature films including Paul Verhoeven’s Academy Award nominee and Golden Globe winner, Elle, starring Isabelle Huppert, BAFTA winner The Imposter, The Lobster, starring Colin Farrell and Rachel Weisz, Green Room with Patrick Stewart, Todd Solondz’, Wiener-Dog, starring Greta Gerwig and Danny DeVito and Swiss Army Man with Daniel Radcliffe.